Dr. Haas, a board-certified orthopedic surgeon, specializes in sports medicine. He completed his undergraduate studies at Yale University and was awarded his medical degree from Albert Einstein College of Medicine. He performed his residency in orthopedic surgery at Montefiore Medical Center and completed a sports medicine fellowship at Boston University Medical Center. There he took care of the Boston University Intercollegiate Athletic Program, including the Top 10 ranked hockey team. He has been a lifelong active athlete, from collegiate soccer to 30 years of racing marathons and triathlons. 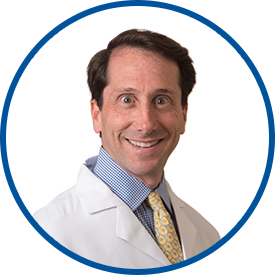 He was the head orthopedist at the Toughman Triathlon Championships and has worked as a physician at the Boston Marathon, U.S. Figure Skating National Championships and the NCAA Division I Men’s Hockey Championships. Dr. Haas has been the team physician for multiple collegiate and high school athletic programs. In addition to caring for athletes, he has run seven marathons, and raced dozens of triathlons, including the Ironman World Championships in Hawaii. This was my first time seeing Dr. Haas, and he was awesome. Very thorough and easy to understand explanations. Straight to the point and overall, extremely friendly and nice. Dr. Haas is terrific. He is extremely thorough and patient. I highly recommend him. he is very nice, kind, soft spoken with the smile! I was given an immediate appointment when I called the office, and got significant relief from my symptoms that very same afternoon. Overall, I was very impressed with the office in general, and Dr. Haas in particular.